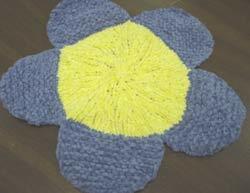 Joann made one of those super cute flower washcloths from Weekend Knitting. 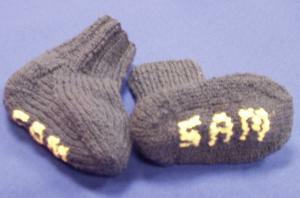 Adorable baby socks with the baby's name written on the bottom, so when he lifts up his little feet everyone can see his name. Too cute! 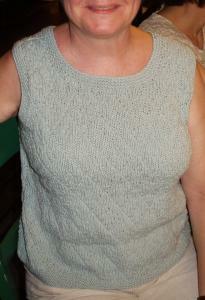 Here's a beautiful tank that Joann just finished (in my favorite yarn, all seasons cotton) with a really lovely diamond stitch pattern. And it's reversible. How cool is that? 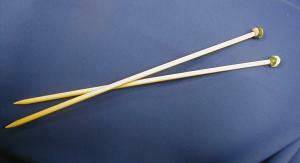 Joann is teaching kids to knit and as a fun project made these cool knitting needles. Neat! The tips are made with Femo and came out so pretty. 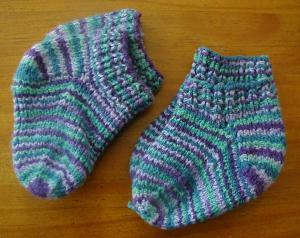 Joann made these cute-as-can-be socks for my boys back when they were little. Joann is our resident sock expert, so I was honored to recieve socks from the master!